These pickles will not last weeks and weeks like your regular pickles. They aren't too acidic. But they make an excellent salad, or braai accompaniment, and will last about 3 days in the fridge. 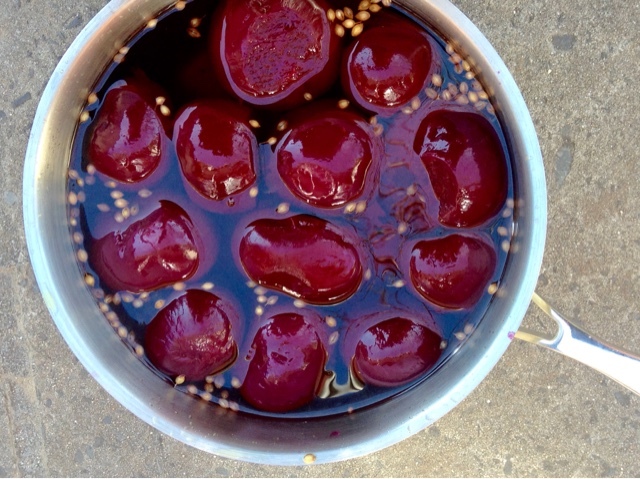 Wash the beetroots and then boil until tender. This will take 10 to 15 minutes depending on the size of the beets. Peel the beetroots (they will peel very easily) and slice. Place a pot on the heat and add the sugar. When it starts to melt, stir well until it turns to a medium brown caramel. Leave to cool slightly and add the water. Return to the heat until the caramel melts into the water. Add the wine vinegar, coriander seeds, peppercorns, fresh thyme, orange peel and the sliced beetroots. Heat until the beets are warm and then leave to marinade.